In the short 23 years that I have walked the earth, I have had several surgeries. Most have been painful, and several have been so awful that I hoped death would soon hover over me. Yet, rarely did I cry; in fact, most of the time I just bit my lip and tried to make it through. Why is this important in a review of the classic romance film Love Story? Well, it's assumed that guys don't cry at movies. After all, how can invented characters mean so much to the us that we shed tears as if it what happens to them were personal to us? Guys play bloody sports where the more blood that is shed is seen as a good indicator of how well someone has played the game. How can a movie make us cry? Oh, and in case you haven't figured it out, Love Storymade me cry. Harvard student Oliver Barrette IV (O'Neal) meets a Radcliffe student named Jennifer Cavilerri (MacGraw). Like most motion picture love stories, fate has a way of keeping the two together even though there are numerous obstacles in their way. When they decide to get married, Oliver's father (Milland) threatens to disinherit him from the family will, leaving Oliver and Jennifer to start their marriage with nothing but love. As the marriage blossoms, the talk of having children does as well. When Jennifer goes to the doctor to discover why it is that she can't get pregnant, it is revealed that she is dying and doesn't have much time left. Love Story is far from the greatest romance film ever made, but the picture does what it should do. It makes the viewer feel for its characters and their pain, and in MacGraw's case, the sadness that a life is about to end. What separates Love Story from the large number of romance films that have come out since is that for once, the story was original. A film like Love Story hadn't been seen with this sort of unabashed romanticism before, and audiences flocked to every screening. In fact, chances are, if the film were to come out today, it would be dismissed and relegated to the buy-one-get-one-free bin at the local Blockbuster. In essence, the story isn't really all that different than, say, this year's Sweet November, but in its time, Love Story was the quintessential romantic drama. Other aspects of Love Story also make it successful. The direction by Arthur Hiller is a large part of why the picture works so well. Hiller takes the one-dimensional characters from author Erich Segal's novel of the same name and adds layers to their personalities. Hiller makes us care about the characters and, when the their love tragically ends, we are in synch with Oliver's emotion. 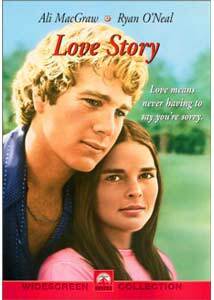 As much as Hiller adds to the picture, Ryan O'Neal and Ali MacGraw take an average story to another level. Their chemistry and personalities carry the viewer along through their relationship, and ultimately to the very end. Image Transfer Review: I will admit that going into Love Story I was expecting the video transfer to be a bit less than stunning. I am happy to say that this 1.85:1 anamorphic widescreen transfer is certainly better than I had hoped and possibly the best this film has ever looked. Detail is good and sharpness is often hampered by the overly soft look of the image. Edge enhancement is a problem as the transfer does show excessive grain. Colors are also a bit subdued, victims of the soft look as well. In the end, this transfer is as good as you will see this film look on home video. Audio Transfer Review: The audio, much like the video transfer, is simply a victim of its age. Presented in English and French mono, this track isn't exactly going to shake the walls but it gets the job done. As this is a mono mix the only thing that seems to matter is the center channel. The dialogue sounds a bit flat at times, and the Academy Award®-winning score fails to sound as full as it should. This mix isn't great, but it certainly could have been much worse. Extras Review: First in the way of extra features for Love Story , Paramount has given us a new audio commentary with director Arthur Hiller. Ultimately, this is a slow moving track that isn't as informative as one might hope. The problem is that Hiller doesn't really have much to say and when he does talk it is often followed by a long period of silence. There are a few nice stories about the production and the cast, but other than those small moments of enjoyment the track is unfortunately slow. The only other feature of note is a fifteen-minute featurette titled Love Story - A Classic Remembered. Both Ryan O'Neal and Ali McGraw join Hiller in remembering the film with brief interviews. If anything, it shows how fond they are of the film that put them on the map. Rounding out the extra features is the film's original theatrical trailer. Considering its many imitators, Love Story is a romance classic. While not everyone will like it, if you are a fan of the film the commentary track and documentary make the disc worth a purchase. If you are curious, or if you are worried about how to make up with a significant other, it is most definitely a rental. It pains me to say this, as it might take away my license as a guy:Recommended. Now where did I put my issues of Maxim, Big Trucks and Sports Illustrated...?